After losing about 10 people to snow blizzards that recently hit the state of New York, the United States is bracing for more snow. Meanwhile, the UK has also issued alerts that a freeze in the next few days is almost certain in all parts of the country. Buffalo, the city that has been majorly hit by US storms, is presently under a snow cover of about 3 feet and according to US’ National Weather Service, its snowfall in a year totals about seven feet. The snowfall was an after-effect of one of the most intense super storms ever recorded in history, creating hurricane-force winds and 26-foot-tall waves. If the forecasts hold true, in three days this month, the city will witness snowfall that will be more than what it receives in these months in a normal year. While the UK has been asked to prepare for temperatures in the range of -7 degree Celsius soon, January could see temperatures hitting “record-breaking” lows of -27 degrees Celsius in the region. According to the country’s Express newspaper, the UK is set to witness three months of blizzards and Arctic gales. This time it may even equal the record historic winter of 1947 which saw snowfall every single day between January and March. While the US and the UK brace for unprecedented snow, climate change experts have been trying to understand if the phenomenon can be associated with Arctic warming and if Arctic freeze or polar vortex will now become regular phenomena. In Popular Science, a research by Jennifer Francis, a climate change researcher with the Institute of Marine and Coastal Sciences in the US, says that as the Arctic warms (and it is warming extraordinarily quickly), the jet stream that regulates weather over the northern hemisphere will weaken and narrow. "When you have a strong jet stream, it's like a thick rope. You can give one end a tug and not much happens," says research. But as it weakens, she says, it's more like a string. A shake (or a typhoon) will send waves all along its length, causing the Arctic monster to move south more often. A report published in Al Jazeera states that according to experts, climate change-induced ocean warming in the Pacific turned Typhoon Nuri (that nearly missed hitting Japan) into a “super typhoon” that punched the jet stream off its course, bringing the North Pole's weather down over the eastern US. However, it has not been officially ascertained yet that the recent chill is related to the polar vortex that left most parts of US and Europe frozen last winter. 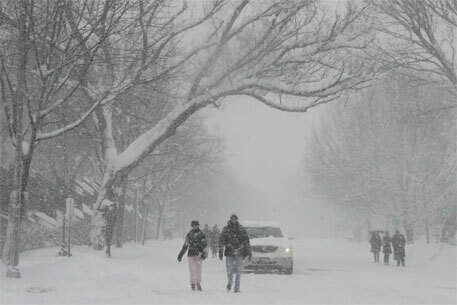 In a blog published by Union of Concerned Scientists, scientist Roberto Mera has written that we cannot associate the blizzard with the phenomenon as it’s simply really cold. It’s an arctic air mass. The polar vortex is currently far north over Hudson Bay in northeastern Canada. From the article it is clear that it is natural phenomenon and not associated with global warming. It happened in 1947, it is happening now and it will happen in future. It is just like our western disturbances -- cold waves in winter and heat waves in summer.